(Updated: April 21, 2016) Roadblocks and missteps are part of the entrepreneurial journey. In a previous post on top startup mistakes, we discussed how committing mistakes is almost inevitable. They happen to business owners, even to those who graduated from prestigious business schools and those who have already made names in their respective industries. Some of history’s biggest business slip ups were caused by negligence, like the Piper Bravo Oil Rig explosion, and some were due to complacency, like Kodak’s downfall. If you are a budding entrepreneur setting up a company in Singapore, you would likely prefer to hear success stories instead of tragic tales about the road you plan to take. But reality says that business blunders are inescapable. The good thing is they do not always lead to dead ends. Getting quality client feedback entails hearing about the negative areas of your business. But these comments can help you know your market more and address their pain points even better. If you can handle damages and dilemmas well, they may even build new doors of opportunities for your business and for your personal growth as an entrepreneur. You won’t be able to move forward if you refuse to accept that a mistake was committed, and it needs resolution. A good way to face the truth with open arms is to recognize that winning and losing are inescapable events or situations in life, and all actions that can turn those events around are still in your hands. It can be very easy to be taken over by emotions in the midst of a business crisis—especially if you are the one in charge. As entrepreneur, you must remain objective. Remember, your business recovery will not depend on how you react but on how you respond to the situation. Before creating an action plan, gather all the information you can to clearly evaluate the extent of the damage. What has caused it? What areas of your business are affected? Could it have been prevented? Seek the opinion of neutral parties or anyone who is not directly involved in your business. The more you know, the easier it will be for you and your team to make informed decisions and address the problem. This will also be helpful in setting up a crises management plan to prevent it from happening again. When Under Armour, official sponsor of the United States Speedskating team during the 2014 Winter Olympics, went under fire when the team did not bring home any medals. Several media agencies speculated that the new UA suit did not deliver on its promise of being the ‘fastest speedskating suit’ ever created. How did the brand react? The UA management practiced transparency and accountability. After releasing a statement, they went against expectations and signed an 8-year partnership with the team. This strategy earned the brand more praise and positive buzz compared to the negative chatter created by the issue. The lesson? Practice accountability and transparency. Create an action plan that is based on your business values. After you assess the damage and gather information, you are more equipped to respond to the situation properly. Ask yourself: What is your desired outcome? Set SMART goals and ensure that each goal is specific, measurable, actionable, realistic and time-specific. Then proceed to outlining the steps you need to take to achieve your objectives. You lost. You made a mistake. You did not achieve one of your business goals. It damaged your pride and self-esteem so you couldn’t take another step without doubting your capabilities and decision-making skill. So that unpleasant feeling of losing is not inside you; nothing is just nurturing the dopamine. In his article for Psychology Today, Dr. Don Greif mentioned the suggestion of his wife, Dr. Elizabeth Stringer, on how to heal what defeat leaves in you: people should diversify one’s self-esteem portfolio. It means finding other sources of confidence, such as other fields you excel in, accomplishments in the past, or a compliment from family and friends. This might appear like a short-term aid, but this can be the first step for you to realize that one mistake won’t define who you are as an entrepreneur. You may not have accomplished a particular task well, but you still have other strengths that you can use to address the mistake and start anew. Whether you or your partner committed the mistake, blaming others would only drain your energy. A mistake is different from a misdeed, though. A mistake may be unintentional and can be forgiven, but a misdeed may take many forms due to wrongful motives, like theft or forgery. Instead of pointing fingers, use your time in discussing what transpired with the goal of preventing the similar situation from happening again. Apologize if you have to. Share what you’ve realized with others. Ask them how they feel and what they think you all can do next time. What operations or policies are they not fully familiar with? Are they more effective in a different position? Do they need motivation or a more challenging task? Treat a mistake as a mine of opportunities. Business mistakes are typically associated with risks. Many aspiring entrepreneurs and even those who have been in the business for a long time hesitate taking risks. However, an Ernst & Young (EY) research shows that entrepreneurs who excel have a strong internal locus of control that is defined by an opportunistic mindset and the right attitude to risk and failure. A willingness to take risks, according to the research, is the core characteristic of entrepreneurial leaders. “Many companies won’t take risks even when they’re about to fail. That’s one reason why they are vulnerable to smaller, more nimble companies run by entrepreneurs that are more willing to take risks,” said Dávila. The mistake you’re dealing with can be a reference for your future strategies. Looking at the situation, what opportunities can you make out of it? What decisions have you made that you need to avoid or to adjust? Has the mistake created gaps or holes on a certain project? How can you fill them? Does the mistake have something to do with your contracts? Maybe it’s a sign that your startup is expanding its services and that hiring a lawyer may prevent you from getting into legal issues as you work on multiple projects. 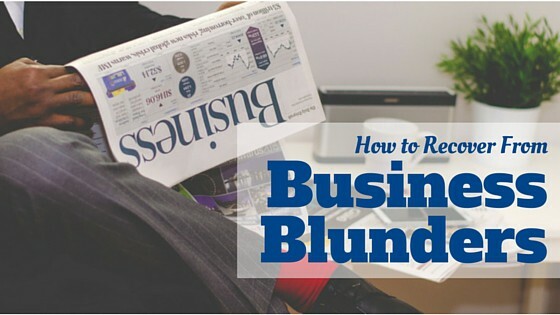 Was the mistake brought by confusion with your payroll or annual reports? Maybe it’s time to hire accounting services in Singapore so you can have experts manage your documents and other filing responsibilities. If you will dwell on anger and frustration, you might miss the fact that dealing with a problem can be the best time to formulate solutions to your old issues, create a new blueprint for your business, or become better as an entrepreneur. Never stop trying and learning. When mistakes happen in the future (and they surely will), remain calm and focus on finding a solution. Mistakes, when addressed properly, can prove that you can be trusted in handling crisis situations. Mistakes can equip you with a fresh perspective, a solid Plan B, and a spirit that’s wiser and stronger. For an entrepreneur like you, this kind of learning should be a continuous process. It may be rough at times, but it’s one that’s worth going through. Richmond provides reliable and affordable corporate solutions from Singapore company registration to corporate secretarial support to tax and accounting services. Have any enquiries? Get in touch with one of our specialists today.